You may or may not have noticed that I've been a little absent around these parts for the past week or so. Well fear not, posts are being lined up as we speak! 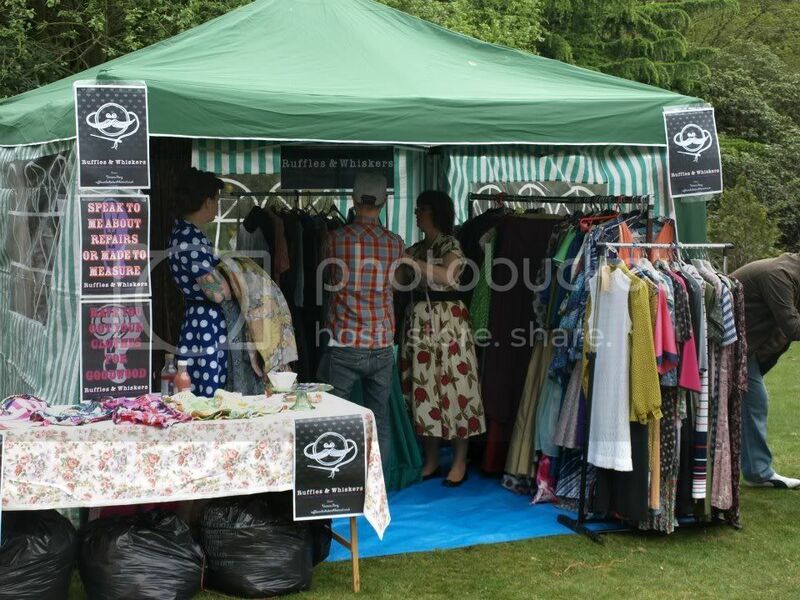 I decided to take a little break from the blog due to me preparing for a vintage car show that I had a stall at. I was busy replacing zippers and buttons, and re-hemming dresses all last week, which was very dull. Mainly because it wasn't going to be me wearing them! Anyway, the car show happened on 19th May, and was a roaring success! I had such a blast that I think I'm going to be going back for the Christmas market they hold in December. There aren't a huge amount of photos floating around as I was slammed from start to finish and didn't get to take many. My husband managed to take a couple on his phone which I will be stealing at a later date, but to those of you who are curious I managed to find a couple of 'official' photos that were taken by the organisers and are available to buy (along with photos of all the cars featured) here. I'm probably not allowed to do this, but here are a couple featuring my stall. 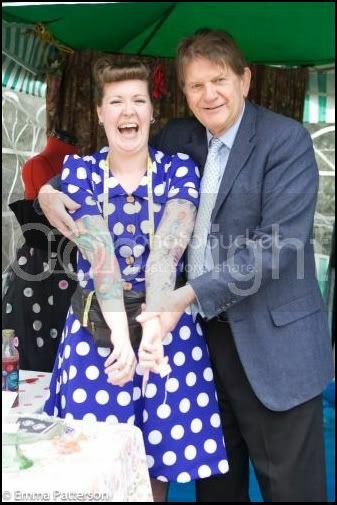 Here is me wearing my 1970's polka dot dress, I've got the most unflattering facial expression going on mainly because the man standing next to me (John Madejski) insisted on scanning the tattoos on my arms. After asking my mother-in-law who he was, he's apparantly the wealthy owner of Reading F.C & the Madejski Stadium situated in Reading also. 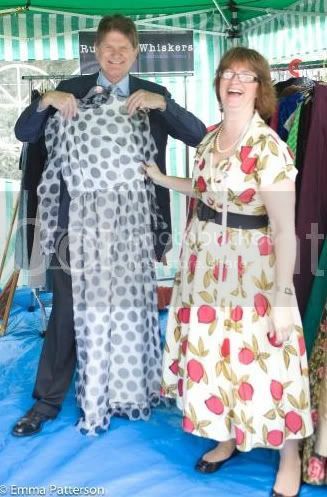 And speaking of my mother-in-law who helped me set up & run the stall, this is Sarah and Mr Madejski. And here's a brief view of my stall overall! My lovely husband made my awesome posters, which I absolutely love! Later this week I hope to have some photos of my finished Butterick dress, as I'm planning on wearing it this weekend. And finally.....it's my birthday tomorrow!! My birthday is my favourite day of the year, more so than Christmas! So i'll share what sewing goodies I'm gifted with later in the week also.